Two of our friends are taking the Paleo/Whole 30 plunge. I’m proud of them. Like Andy and I, they, too, enjoy a cold beer, Chinese food, and well… anything bad for you that tastes so so good. And when they heard about how Andy and I were actually pretty successful at making meals feel like you weren’t suffering, they agreed to come over our house for the football game – Paleo food only served. 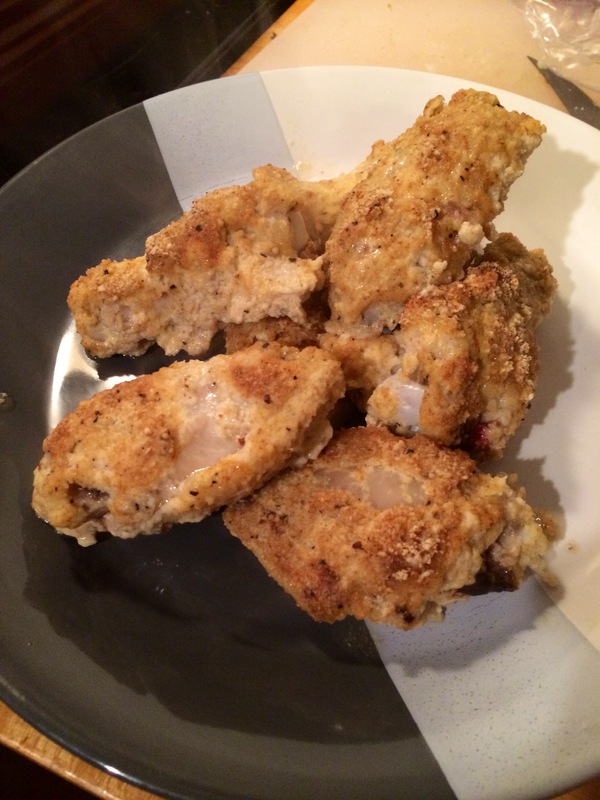 Which is exactly how I came up with these Paleo breaded chicken wings. Now stop right there. They are approved. My secret? Almond flour. All the crispy crunch of a breaded wing, without the bad stuff. Place pan(s) in oven. Cook for 35 minutes, then turn chicken over. At this point, if your chicken had excess water in it, you might notice your pan has some water in it, carefully drain from pan. Place pan back in oven and cook for another 35-40 minutes. Make sure chicken is white inside, serve and enjoy.